The Samye Monastery trek is one of the fines easy trekkings we offer in central Tibet. After visiting and exploring the main capital of Lhasa, you will drive 60 km to Ganden monastery built in 1407. Then we start an unforgettable 4 days to walk from Ganden to Samye Monastery in one of the most beautiful areas of Tibet. Day 01 : Fly from Kathmandu to Lhasa. Is the capital of the Tibet Autonomous Region in the People’s Republic of China. It is located at the foot of Mount Gephel and is one of the highest provincial capitals in the world. It is the location of the Potala and Norbulingka palaces (both are included as World Heritage Sites and is the birthplace of Tibetan Buddhism. The Jokhang in Lhasa is regarded as the holiest centre in Tibet. Lhasa literally means “place of the gods”. At an altitude is 3,490 metres (11,450 ft), Lhasa is one of the highest cities in the world, covering a flat river valley in the Himalaya Mountains. Day 02-03 : Sightseeing tour of Lhasa. Lhasa has many sites of historic interest, including the Potala Palace, Jokhang Temple, Sera Monastery, Zhefeng Temple, Drepung Monastery and Norbulingka.The city of Lhasa contains three concentric paths used by pilgrims to walk around the sacred Johkhang Temple, many of whom make full or partial prostrations along these routes in order to gain spiritual merit. The innermost, the Nangkor (Nang-skor), is contained within the Jokhang Temple, and surrounds the sanctuary of the Jowo Shakyamuni, the most sacred statue in Tibetan Buddhism. The middle circumambulatory, the Barkor (Bar-skor), passes through the Old Town and surrounds the Jokhang Temple and various other buildings in its vicinity. The outer Lingkor (Gling-skor) encircles the entire traditional city of Lhasa. Excursion to Ganden Monastery. (120 Kms, 3hrs driving, 3650m). Ganden Monastery (also Gaden or Gandain) is one of the ‘great three’ Gelukpa university monasteries of Tibet, located at the top of Wangbur Mountain. It contained more than two dozen major chapels with large Buddha statues. 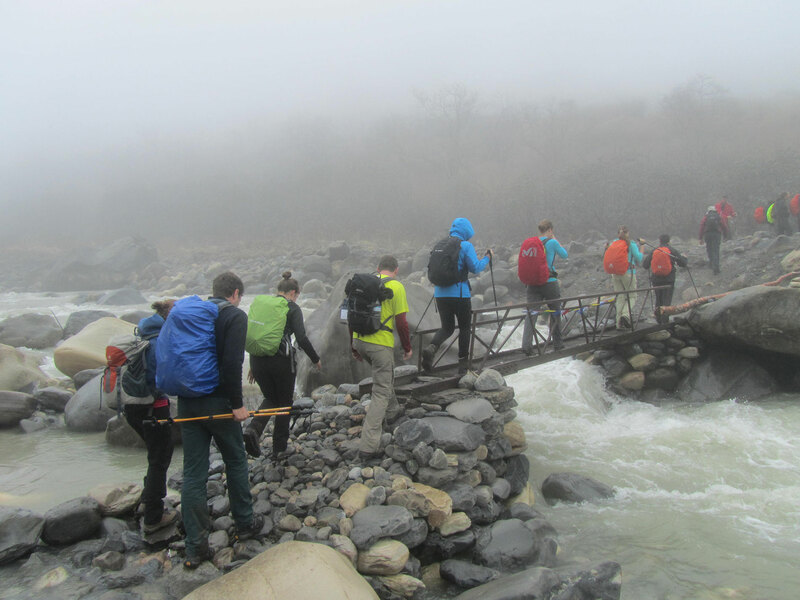 Day 05-08 : Trek from Ganden to Samye. The Samye Monastery or Samye Gompa is the first Buddhist monastery built in Tibet under the patronage of King Trisong Detsen of Tibet who sought to revitalize Buddhism. Day 09 : Samaye to Tsetang. Tsetang is one of the largest cities in Tibet and is located in the Yarlung Valley, 183 km southeast of Lhasa. Tsetang was the seat of the ancient kings of Tibet and, as such, a place of great importance. It is at an elevation of 3,100 metres. It is situated near the flank of Mount Gongbori (3.400m) and is home to many ancient ruins. It is known as the cradle of Tibetan’s civilization. Day 10: Transfer to airport for departure to Kathmandu. If you like this itinerary, or want a less easy walk, also consider our Central Tibet Trek! Going to Tibet with Himalayan Leaders was awesome. We had a great trip with a small group of just four via the Tibetian high plateau to Lhasa on the Friendship Highway. We enjoyed having a well informed guide with us who knew nearly every single of the thousands of buddhas existing. We stopped at a flour mill to learn about the production of Tsampa, enjoyed living close to the people and had awesome views on the way including a lot of cultural highlights. 1000 kilometer driving through an awesome country – and not boring at all! Thanks for that experience! Going to Tibet with Himalayan Leaders was awesome. We had a great trip with a small group of just four via the Tibetian high plateau to Lhasa on the Friendship Highway. We enjoyed having a well-informed guide with us who knew nearly every single of the thousands of buddhas existing. We stopped at a flour mill to learn about the production of Tsampa, enjoyed living close to the people and had awesome views on the way including a lot of cultural highlights. 1000 kilometer driving through an awesome country – and not boring at all! Thanks for that experience!